Explore the sprawling city of Los Angeles with a German-speaking tour guide. See the best of Hollywood and Beverly Hills, home to the stars, as well as Rodeo Drive, the Walk of Fame, and Sunset Strip. Visit Venice Beach and the Santa Monica Pier. This Sightseeing tour is only for German speaking guests. With a small group up to 15 passengers. On this 9-hour tour you’ll take in the highlights of Los Angeles. Your day begins with a pick-up at 07:00 when you’ll set off with your German-speaking guide to visit some of the city’s most iconic sites. Start out in Beverly Hills and marvel at some of the multi-million dollar homes of the rich and famous. 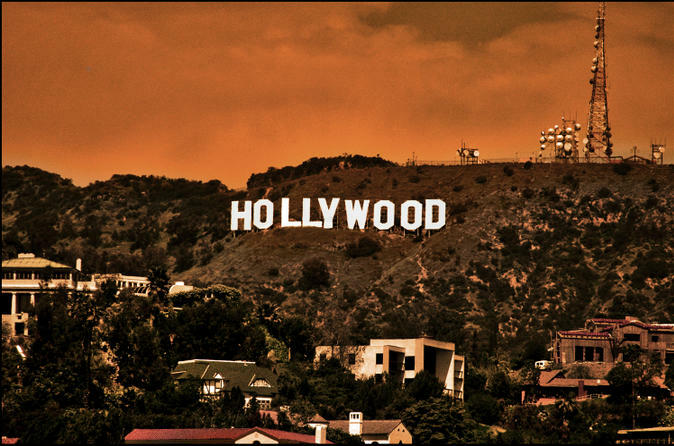 Celebrities, movie stars, and wealthy business tycoons call this area home. Keep on the lookout for your favorite stars! Head to Rodeo Drive, one of the world‘s most exclusive shopping boulevards. Gaze in awe at the designer boutiques and glamorous stores. Next, Hollywood is calling. Visit the Walk of Fame and try to find your favorite actors from the 2,500-odd stars along the sidewalk. See the Dolby Theater (formerly the Kodak Theater), the Chinese Theater, the Roosevelt Hotel, Mulholland Drive, and the Hollywood Bowl overlook. Continue the tour from Sunset Strip to world-famous Venice Beach, finishing up at Santa Monica Pier and the quaint Venice Canal Historic District. Depending on timing and traffic, you may have time for a stop at Century City or Santa Monica Place for a lunch break or a bit of shopping.